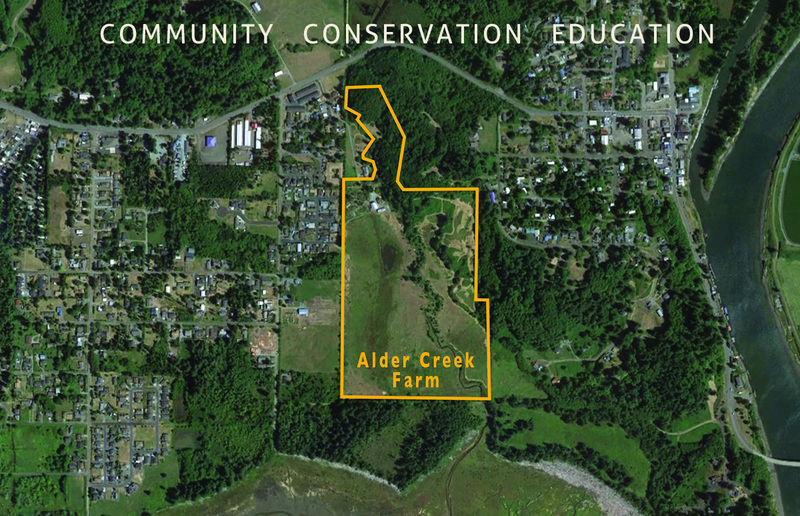 Alder Creek Farm, located at 35955 Underhill Lane, Nehalem hosts a community garden, greenhouse, ethnobotanical trail, native plant nursery and a 50-acre wildlife sanctuary on the north edge of Nehalem Bay. The Trust purchased the property, a former dairy farm owned by the Anderson family, in 2005 with funding support from partners Natural Resources Conservation Service and Oregon Watershed Enhancement Board, who both hold conservation easements on the Farm’s wildlife sanctuary. We immediately went to work restoring historic riparian vegetation, wetlands habitats, tidal sloughs and removing invasive plants and introducing native plant species. Alder Creek Farm is a stop on the Oregon Coast Birding Trail and also a hotspot on Cornell Lab of Ornithology and National Audubon Society’s eBird.org. An example of successful conservation and restoration, the Farm is enjoyed by community members at special events like the annual Harvest Festival and open house community garden days throughout the year. Five community members purchased the 54-acre historic dairy farm in 2003 and then leased the property to the Trust for management. The Trust acquired the land in November 2005 using funds from the Oregon Watershed Enhancement Board, a U.S. Fish and Wildlife North American Wetlands Conservation Act small grant, USDA Wetland Reserve funding, and local donations from the community. Get our eBulletin about events, progress, and community gatherings. Our mission is to preserve land and nurture conservation values in partnership with an engaged community in the Nehalem region of the Oregon Coast. Copyright © 2019 Lower Nehalem Community Trust. All rights reserved. Site by Ruby Slipper.